The possibility that a single miRNA could potentially control several genes, opens a new perspective of analyzing post-transcriptional gene regulation. Pathway analysis is a powerful technique that allow to determine globally controlled processes by a single or by a combination of miRNAs. In this tutorial we will learn how to use pathway analysis to predict the possible flow control of miR-21. For the analysis, we will use the miRpath server. The list include the name of the pathway, genes potentially targetted by miR-21 and a ranking score. The score is calculated on the basis of the number of potentially targetted genes and also the position of these genes within the pathway. Top scores mean a higher possibility of control by the selected miRNA. 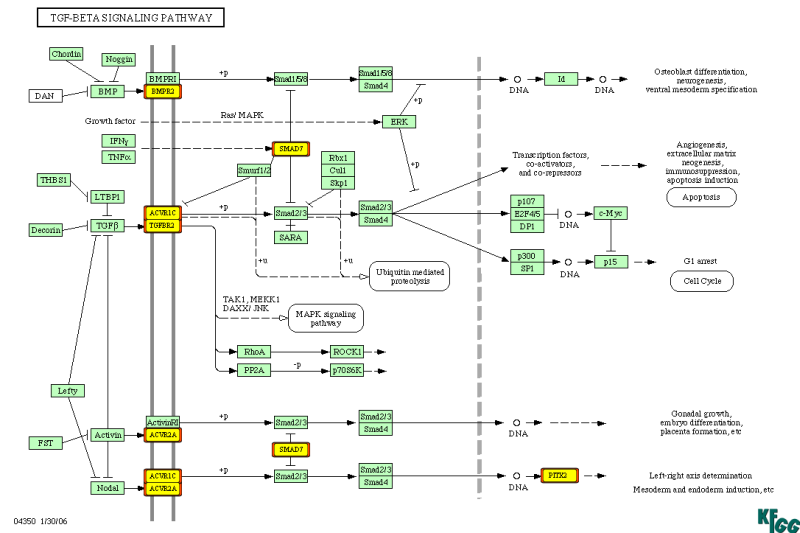 The pathway names are dynamic links that will redirect us to a graphical display of the pathway flow and the genes with putative targets for miR21 (see diagram below for the results on the TGF-beta signalling pathway). Possible role of miR-21 in the pathway. Position of the putative genes controlled by miR-21 in the global pathway flow. Connections with other pathways possibly involved in cancer.